When my mother cooked me peas and carrots, she would have to pick out the "undesirables," peas which were wrinkly and not perfectly spherical, carrots not perfectly cubed. Were I to find one vegetable bit not to my liking, I would gingerly, between thumb and forefinger like deceased rodent, remove the offending party to the opposite side of my plate. I apologize to my mother wholeheartedly. Also no gross crap like bull testicles or tripe, but that rarely comes up in everyday meal planning. I've actually found I have a bit of a knack for cooking. Oddly, I also enjoy it. I'm willing to experiment more with flavors and processes. This has carried over into my eating habits out in the wild. The trouble remains, I am not inclined to try something new at any time I am ravenously hungry or at a location where I have an established favorite dish. I become unwilling to risk a new delight on the possibility it may turn out to be awful and I have wasted money and remain hungry. But, man, on special occasions I'll stuff pretty much anything down my gullet. A couple weeks ago some producer dude from L.A. bought us all appetizers to use as props (no one actually eats on television) and I chomped a fried chicken finger in between takes. It was not chicken. Upon close examination, it was a fried shrimp. A very flat shrimp. I was quite disturbed. 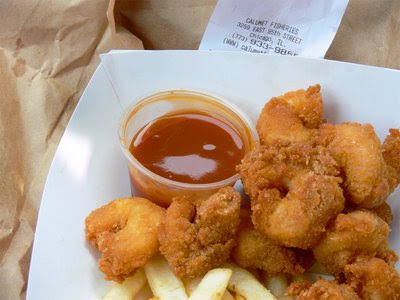 This violated not one, but two of my no-go food rules, seafood and technically the "still looks alive" thing, as shrimp–minus the breading–are this rule's greatest offenders one side of a suckling pig. Good thing freeze-dried fried shrimp come so bland and tasteless I didn't have an opportunity to freak out. Just chew, swallow and switch back to a more reasonable food. Like a fried pickle. This is my default cooking image. You'd not be surprised how many more hits it gets me.